Police in St. Louis used tear gas to disperse protesters who threw rocks and broke a window in the mayor's home Friday night — hours after a white former officer was acquitted in the 2011 shooting death of a black man. At least 32 people were arrested and nine city officers were injured as hundreds took to the streets in largely peaceful demonstrations against the verdict, Interim St. Louis Police Chief Lawrence O'Toole said early Saturday. In addition, a St. Louis County police officer and a Missouri State Highway Patrol trooper were hurt. Some of the officers were harmed by thrown bricks, police said, and they had to use tear gas and pepper balls on the crowd. Former officer Jason Stockley was found not guilty of first-degree murder and armed criminal action charges by St. Louis Circuit Judge Timothy Wilson, who presided over the racially charged case. Stockley escaped what could have been a lengthy prison sentence despite the fact that he was recorded on an internal video camera during the pursuit apparently saying he intended to kill Anthony Lamar Smith. "Many of the demonstrators were peaceful," O’Toole said in a video message early Saturday. “However, after dark many agitators began to destroy property and assault police officers." St. Louis police said on Twitter shortly before 10 p.m. local time that "agitators have converged on Mayor Krewson's house. Throwing rocks and breaking windows, despite being instructed not to." Protesters broke a window and splattered paint on Mayor Lyda Krewson's house. The assembly was declared unlawful and tear gas was used, police said. Earlier some sections of downtown were closed off and there was sporadic violence as protesters pelted police officers with water bottles and rocks and ignored repeated orders to disperse, St. Louis police reported. Wells Fargo, Stifel, Nestle and some of St. Louis' other big employers sent thousands of workers home early as a precaution. Krewson earlier urged St. Louis residents to "show each other compassion." "My thoughts and prayers are with the family and friends of Anthony Lamar Smith, our police, judge, prosecutor, our citizens who find no comfort or justice, and everyone involved in this difficult case," Krewson said in a statement. "I am appalled by what happened to Anthony Lamar Smith. I am sobered by this outcome." 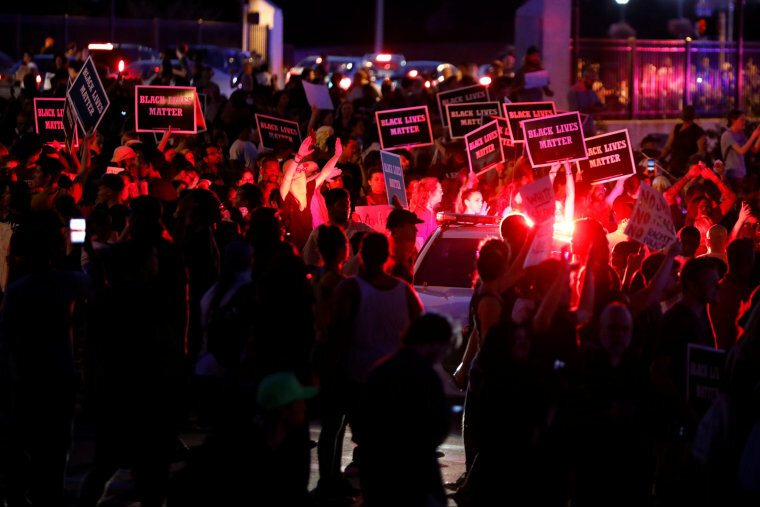 The Stockley case rekindled racial tensions not seen in the St. Louis-area since 2014 when sometimes violent unrest erupted in nearby Ferguson, Missouri, after the fatal police shooting of Michael Brown. Activists backed by many of St. Louis' black clergy had vowed to stage protests if Wilson acquitted Stockley. Smith was 24, a new dad and engaged to be married when he was killed. But in his ruling, the judge called him an "urban heroin dealer" while noting that Stockley was a West Point graduate who had served in Iraq and suffered a back injury during a Baghdad hotel bombing. In their initial report, police said Smith was doing a drug deal behind a fried chicken restaurant north of downtown St. Louis when he took off in a silver Buick, twice crashing into a police vehicle. In Wilson's ruling and in documents obtained by NBC affiliate KSDK, Stockley could be heard saying "we're killing this (expletive), don't you know." But the judge said this was not proof Stockley wanted to kill Smith, calling the remark "ambiguous." "People say all kinds of things in the heat of the moment or while in stressful situations," he wrote. Wilson also wrote that Stockley "did not approach the Buick and immediately shoot Smith multiple times." Instead, the judge said Stockley "ordered Smith to open the door and to show his hands." "The defense does not deny that Stockley shot and killed Smith," the judge wrote. "Rather, the defense contends Stockley acted in self-defense." In May 2016, when Stockley was charged with first-degree murder, prosecutors said that a gun found in Smith's car had only Stockley's DNA on it. Wilson also said there was no evidence to suggest Stockley "planted the handgun found in the Buick." He said the state's own witnesses "testified that the absence of a person's DNA on a gun does not mean that person did not touch the gun." "Finally, the Court observes, based on its nearly 30 years on the bench, that an urban heroin dealer not in possession of a firearm would be an anomaly," Wilson wrote. The prosecutor, Circuit Attorney Kimberly Gardner, said she was "disappointed with the court's decision." "In light of the verdict, it’s time to take a harder look at how officer-involved shootings are addressed in our city," she said. Gardner said she understands and appreciates "the many challenges that face our city’s police officers." After the Smith killing, homicide detectives from the St. Louis Metropolitan Police Department deemed it justifiable. But Stockley resigned from the force in 2013, the same year that the Board of Police Commissioners settled a wrongful death suit with Smith's family for $900,000. When Stockley was charged with premeditated murder, he opted for a bench trial rather than take his chances with a jury. After Friday night's protests, further public rallies were expected Saturday. Irish rockers U2 announced their Saturday night concert in St. Louis was canceled and would be offering refunds after police said they were "not in a position to provide the standard protection for our audience as would be expected for an event of this size." CORRECTION (Sept. 16, 12:50 p.m.):An earlier version of this article misstated the first name of the man killed by police. His name is Anthony Lamar Smith, not Adam Lamar Smith. Jay Varela, Shamar Walters and Associated Press contributed.